Objective Flame detection can effectively prevent the occurrence of fire. 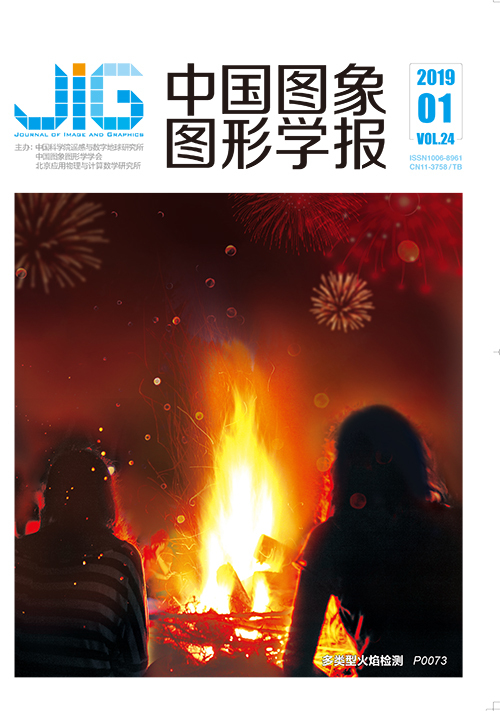 Traditional image processing techniques for current flame detection methods have low anti-interference ability and generalization, and the detection effect is highly sensitive to data fluctuations. 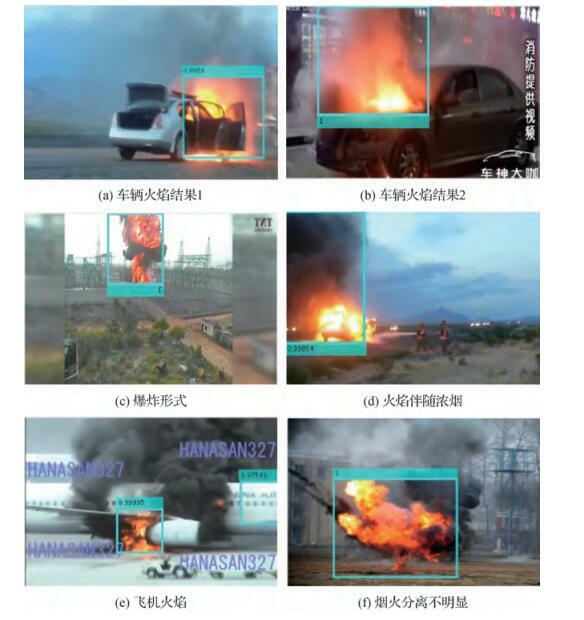 Machine learning must set and extract the characteristics of a suitable flame on the basis of different scenarios, and this process is complex. 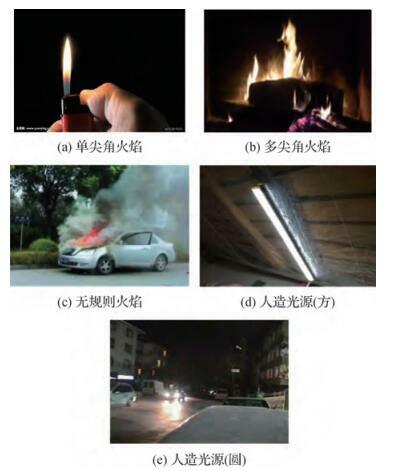 To avoid complex artificial feature extraction and ensure good detection accuracy in the presence of complex backgrounds, lighting changes, and various forms of flame images, a multi-type flame detection method based on Faster R-CNN was proposed. Method This method is based on deep learning and uses convolutional neural networks to automatically learn to acquire image features. First, visual tasks were established using self-built datasets. 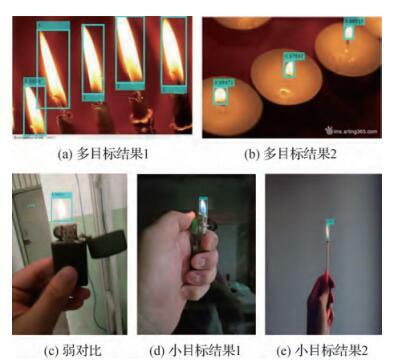 According to the sharp angle characteristics of the fire, the visual shape, and the amount of smoke, the flame data were divided into three types, namely, single point, multi-point, and shapeless flames. In addition, in-depth network feature visualization experiments revealed that the artificial light source and the flame have similarities in contour. 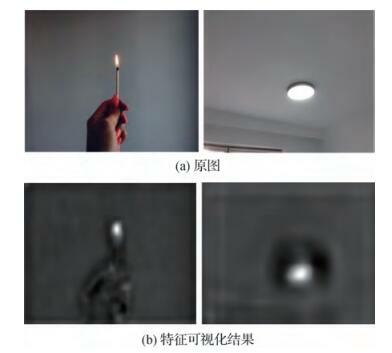 Thus, two datasets of artificial light sources (circular and square) were established as interference items to ensure the stability of the detection model. Then, the training parameters were refined, and the pre-trained convolutional neural network structure was adjusted. 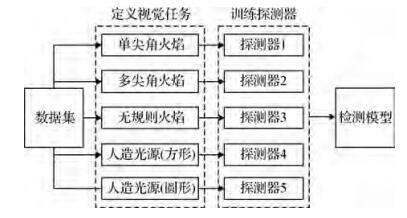 The classification layer was modified to satisfy specific visual tasks. The image features abstracted by the convolutional and pooling layers in the deep convolutional neural network were sent to the region proposal network for regression calculation, and the corresponding detectors for each type of target object were obtained by transfer learning strategy. Finally, the target detection model based on the visual tasks was obtained, and the weights and bias parameters were saved. The sub-detectors of various target objects in parallel were used as the overall detector. The scores of various detectors were output during the detection, and the highest score was considered the correct detection item. Result First, the trained detectors and the corresponding test dataset were used for testing. Then, the test sets of various targets were utilized to test the detection effect of other types of detectors to prove the mutuality between detectors. The experiments demonstrated that all kinds of detectors had a high specificity, which greatly reduced the possibility of misjudgment, and good detection accuracy for flame images with sharp deformations and complex backgrounds. The detection model obtained through training achieved good results when dealing with difficult situations, such as small targets, multiple targets, various forms, complex backgrounds, and lighting changes. The results showed that the average accuracy of various types of detectors increased between 3.03% and 8.78%. 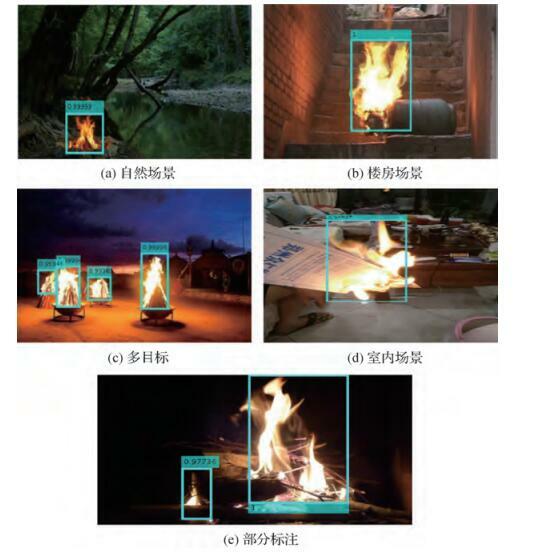 Conclusion The proposed flame detection method subdivided the flame category by excavating the visual morphological characteristics of the flame and using the deep convolutional neural network instead of manual feature setting and extraction process. By combining self-built datasets and network models that were modified based on visual tasks, a multi-type flame detection model with good detection results was obtained. 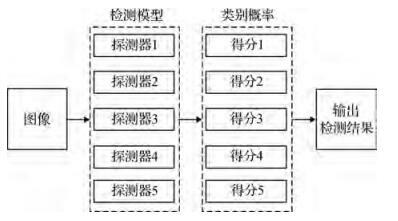 By using the concept of deep learning, the tedious artificial feature extraction is avoided, and a good detection effect, is achieved. 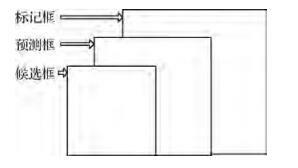 In addition, the model has a strong anti-interference ability. This article provides a more general and concise solution to the problem of flame detection.